For those customers who have expressed an interest in a metal end stop that is compatible with the 88001 privacy cubicle tracks, also know as hospital tracks, we are pleased to introduce the 88136 Metal End Stop. 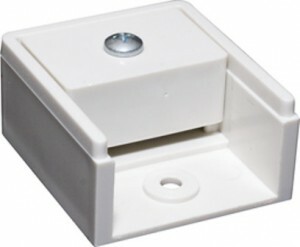 This end stop, with its metallic silver finish, provides an alternative to the off-white plastic 88132 End Cap with Removable Gate that has been offered on Curtain-Tracks.com for quite some time. 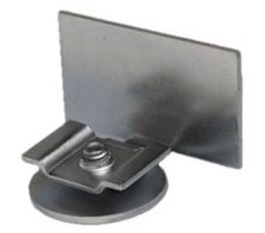 This metal end stop can easily be removed after installation, as it is locked in place in the slot by the set screw that is included (the 88132 End Cap is mounted above the track during installation). Because there is no block/gate with this model, the track can be extended all the way to a vertical surface or wall if required. Either end cap provides a suitable option, and now the customer has a choice of styles and appearances. Regardless, we do recommend that customers use end stops on each end of the track. It is important to be able to add or remove carriers after installation. This can be the result of the addition of a different width privacy cubicle curtain than was originally installed, or a carrier that may have broken during misuse. It is also advisable to avoid having the carriers rubbing against dry wall or sheet rock when a track terminates at a wall, as the motion of the carriers can wear away the wall surface over time.